Champions League football has returned! The biggest clash of this week saw Chelsea come up against PSG for the third consecutive season. Laurent Blanc’s side came out with a win after dominating for almost the full 90 minutes as their centrally-oriented attacking strategy worked well against Chelsea’s weak defence. Every football fan’s prayers were answered as Marco Verratti made his first start since returning from injury whilst Aurier was absent after recent controversies as Marquinhos took over the right-back role. Chelsea turned out in their usual 4-2-3-1 shape with Willian performing an important role in the centre of the attacking trio behind Costa. Through the opening 20 minutes Chelsea were unable to maintain possession of the ball as PSG enforced sustained pressure on the away side’s final third. Blanc’s side counterpressed well to regain the ball quickly upon a turnover and were able to develop a control over the game from very early in. Their centrally-oriented positional structure allowed them to profit from immediate access to the ball once it was lost, with short distances between players facilitating strong compactness around the ball with good defensive connections for a polyvalent counterpress. Their inability to sustain possession was also a fault of Chelsea’s. Once they managed to regain the ball from Paris they made a number of weak attempts to form a counter-attack, which often broke down whilst the ball was still within their own half. Their weak transition game was in some part due to the defensive structure as it made for sub-optimal starting positions upon the turnover. The counters were also quite individualistic, with the ball being lost usually following a dribble attempt which PSG defended with some ease. From the first minute, PSG were able to control the game in possession and retain the ball well in the Chelsea half. Due to a weak positional structure and some weak individual abilities (I’m looking at you, Cesc) Chelsea were unable to develop strong access to the ball whilst PSG’s ball-oriented shape gave them collective pressing-resistance. The result was Blanc’s side being able to maintain the ball and develop attacks with less disruption from oppositional pressure. Paris’ attacking strategy was primarily based around overloading the centre of Chelsea’s midfield as the front three showed strong movements towards the middle to act as free men against the struggling Mikel and Fabregas. Considering how well this exploited Chelsea’s defensive issues, it must be noted that this wasn’t a strategical adaption from PSG, whose centrally-focused positional structure is a key component of their game. Given this lack of adaption one must imagine the preparation made by Chelsea whose man-oriented defending was ill-equipped to deal with such offensive fluidity and central-focus. For the most part in fact, PSG made a very typical performance as Verratti slotted straight back in, immediately making movements towards the central in his rotations with Motta. Ibrahimovic made deeper movements from his striker position whilst the two wingers moved inside. With Marquinhos on the right of the defence, there were perhaps some more common balancing movements towards the right wing yet aside from that, Blanc’s side played their natural game. Particularly through the first 30 minutes, PSG consistently were able to create free men within Chelsea’s midfield as they overloaded the opposition with ease. Whilst the two full-backs worked well to occupy the flanks, the rest of the side (excluding more situational movements from the two wingers) moved inwards to form strong connections between the half-spaces. Mikel and Fabregas struggled to cover the players despite support from Costa and moreso Willian as players such as Verratti, Di Maria and Lucas kept finding the ball within the defensive gaps. Despite PSG’s ability to create instability within Chelsea’s defensive block they struggled to develop the possession further and capitalise on these situations. Between the attack they were seemingly unable to unlock Chelsea’s defence and failed to break the last line of defence as Hiddink’s side relied heavily at times on individual defending and stronger recoveries. PSG’s inconsistent spacing was partly a cause of their inability to create in the final third too. With their free-form nature comes a high reliance on synergy between players to form connections and space themselves correctly, which PSG could not always achieve. Although they were able to break the first line of defence and move the ball into gaps in Chelsea’s midfield, they were unable to then carry the ball forwards and maintain possession. The connections were thus sub-optimal and PSG were unable to consistently carry the ball forward as a team through their usual combinations. In some cases they relied more on individual actions, most often through the dribbling of Lucas who created a number of promising situations; least of which the free-kick which resulted in Ibrahimovic’s opener late in the first half. The Brazilian’s vertical dribbling ability worked well to destabilise Chelsea and quickly break through lines of defence, even if he showed a lack of efficiency in the chances he created for himself. 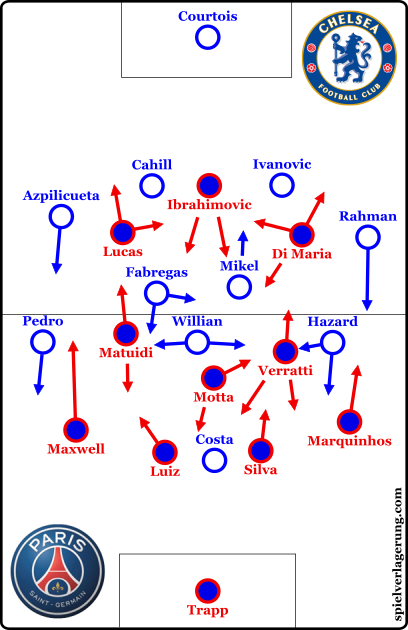 Without regard for team-tactical concepts such as structural balance and simple support between teammates, Chelsea’s man-orientation resulted in a disconnected defence. Realistically their struggles against the fluidity of PSG’s attacking movements was inevitable as they were unable to effectively defend the space within the defensive block. Although Willian impressed in support for the central midfielders whilst Costa also worked quite well, the midfield was simply too open as the opposition were able to create gaps for their forwards to receive the ball between the lines. As the two wingers were drawn away from the centre, neither Mikel and Fabregas (a terribly bad individual defender already) struggled as PSG relentlessly overloaded them. The orientation of the wingers was a prime example of their disconnections through midfield as neither could support their near central midfielder whilst the likes of Di Maria and Lucas moved between often. In a number of scenes the Chelsea wingers would become situational full-backs creating either a 5-3-1-1 shape or in special cases a 6-2-1-1 where Mikel and Fabregas had far too much space horizontally to cover. The wingers didn’t have to be in the defensive line to be disconnected however. Their orientation to the PSG full-back resulted that the majority of their movements were orientated towards their man and they gave minimal regard for supporting the half-space where Mikel or Fabregas were struggling to cover. Although the positioning was a prime example of the issue with the wingers, all you had to do was watch their defensive movements to see where their priorities were. Despite having some issues in converting their final third possession into chances, PSG were generally in control through the game as they aimed to create overloads within Chelsea’s defence. Chelsea’s man-orientations were rather ineffective as a more zonal scheme could theoretically have been better against PSG’s offensive fluidity. The away side only threatened intermittently through the game with a few chances coming towards the end of the 1st half in a clearly defensive-minded performance from Hiddink’s side.